Atsuko has been sharing her knowledge and techniques of Japanese cooking with a series of classes, which introduces family favourites, alongside the art of sushi making. 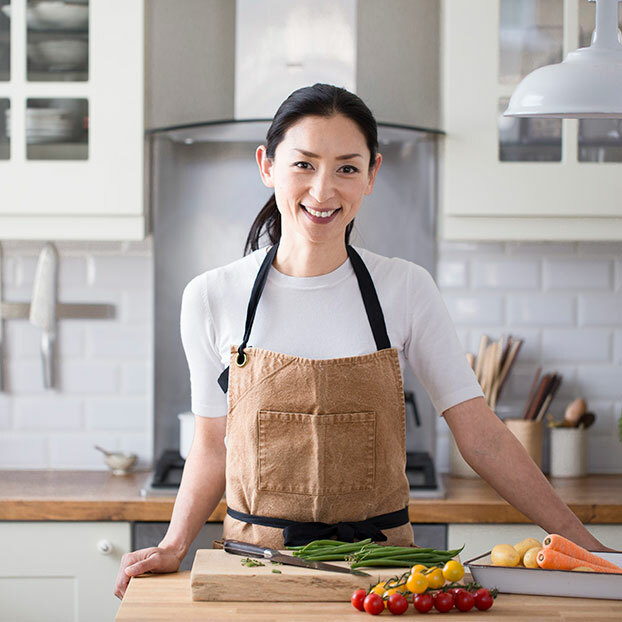 Her passion for food and ability to impart serious culinary skills and principles with humour and warmth draw people to Atsuko’s Kitchen from all across London and further afield. Those who have enjoyed the expertise and entertainment of her hands-on cooking classes now number in their thousands and have been from a complete range of ages, nationalities and levels of culinary confidence. Her classes are informal and interactive, resembling more of a dinner party with friends than a classroom lesson. Her down-to-earth and unpretentious approach to cuisine combined with her talent to create delicious, simple to prepare, beautiful meals perfectly impart the Japanese philosophy of elegance and simplicity. Apart from teaching at Atsuko’s Kitchen, Atsuko also regularly conducts classes at Divertimenti, and other cookery schools across the UK. A photography graduate from the London College of Communication, Atsuko is a certificated nutritionist from the College of Naturopathic Medicine. She studied the art of Shojin Ryori (a healthy vegan cuisine derived from Japan’s Buddhist origins) from the Japanese Buddhist Cuisine and has also received professional training in Wagashi (Japanese confection) and Kazari sushi-making. I’m from Kyushu, which is the southern island of Japan. Kyushu’s great climate means it produces one fifth of Japans agricultural goods. It’s also known as the Food Island, and is famous for fresh seafood, mackerel (which you can eat raw), nori from the Ariake Sea, green tea, renkon (lotus root), and shochu. And there are also many beautiful hot water springs called Onsen – one of my favourite ways to relax! Most of the recipes I teach are traditional family recipes handed down through generations. My mother and grandmother were both great cooks, and shared their knowledge with me. I have also studied ‘Shojin-Ryori‘ – a really healthy style of Japanese vegan cuisine, which complements my family’s culinary philosophy. I have travelled all over the world, from frequent trips to Italy to sailing from the UK to South America, exploring the culture and food in each country (on the yacht we ate a lot of fish!) When I visit a country I always go to the local market to research the food. It is the best way to find out about the local people, what they eat, and how they cook. This always excited my curiosity. Meanwhile I have taught Japanese cooking in Argentina, New Zealand and now based in the UK – these experiences helped me create “Washoku” authentic Japanese dishes miles away from home. You can find enough ingredients in most modern supermarkets to make some great tasting and healthy meals. Now, since 2008, I have taught authentic Japanese home style cooking in the U.K. You can learn how to make the popular dishes from Japan, and even make some delicious meals you would have never seen on a restaurant menu before. Let’s enjoy Japanese cooking together!